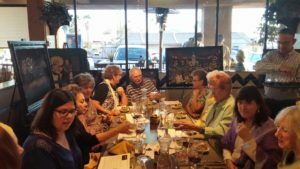 on March 2, 2016, Kim Fernandez, a financial advisor at Waddell & Reed invited me to be the featured artist at her monthly wine tasting event for her clients. It was a wonderful evening to show my art, talk about the pieces I brought to display and meet people who had not seen my art before. Thank you Kim for the opportunity!